Adding basic data labels to a chart can be done without using any programming code. This blog, however, shows you how to fine-tune Excel chart labels using VBA (Visual Basic for Applications) macros. If you don't like typing, feel free to copy and paste the code from this page directly into your module - it's not considered cheating! 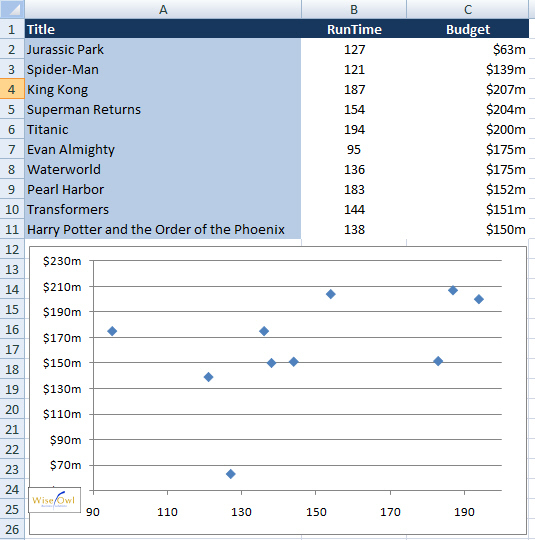 The starting point for this example is an Excel file containing a simple table of data and with a scatter chart embedded on the same worksheet. You can use your own spreadsheet if you have one available, or download our simple list of films by clicking here. This is the starting point for our example - a simple table of data, with a chart on the same worksheet. Once you have your Excel file open, our next job is to get into the Visual Basic Editor application. 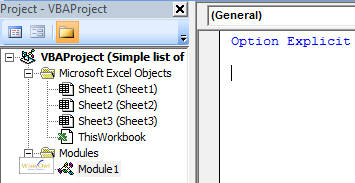 Whichever version of Excel you're working in, you can hold down the ALT key and press F11 to open the VB Editor. This is what you should see having followed the above steps. If you don't see the phrase Option Explicit at the top of the page, feel free to type it in. The VB Editor fills in the required extra bits of code for you automatically. Helpful or what? So far, so good, but things get a bit more complicated from here on in. Read on if you're still feeling brave!